Craft stations are a great way for artists or even professional draftsmen who require a dedicated space to ply their craft. Equipped with storage compartments, tilting glass surfaces, & sturdy designs, these drafting desks, as they are often called, make for unexpectedly attractive as well as highly functional sidepieces for your home or office. One buyer we spoke with endorsed this arts and crafts desk as an amazing work space for your a variety of craft projects. A clean and stylish option, the build material is high-quality and not too difficult to assemble. It does ship with assembly tools, but some users employed their own tools to get it built. Some users even installed under-cabinet fluorescent lights beneath the table to turn the craft station into a light table. In general, buyers say that it is a great place to do sketches, perform ink drawings, and work and on other art formats in a dedicated and organized manner. The Futura's main work area surface measures 38" x 24"
Take a look at our top 5 craft desk selections below - you will undoubtedly be able to find a craft desk that is suited to your needs. How Easy is it to Assemble a Craft Station? Let’s Take a Look! What Are The Benefits of Crafting? 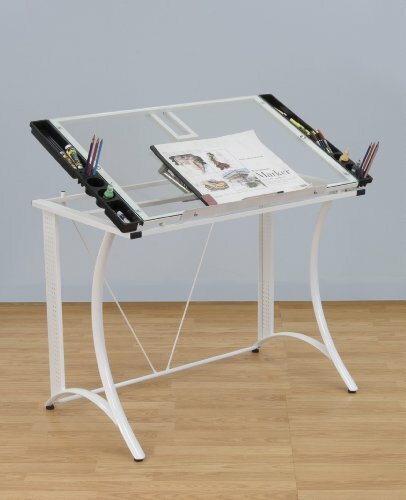 This deluxe craft station is perfect for doing crafts and light sketching. It has a 36” wide and 26” deep main work surface which can be adjusted to 40 degrees. One of the features many customers liked was its weight of only 33.8 pounds, which makes it highly portable. As well, it is noted for being easily assembled and disassembled. It is a perfect gift and absolutely suitable for beginners, as well as more practiced users, both young and old alike. Slick design and stylish glass is what makes this product really stand out. Weighing only 48 pounds this craft station comes in 3 color variants: Black/Black Glass, Black/Clear Glass and Silver/Blue Glass. The Futura craft station is an exceptional option for drawing, drafting and crafting on its large work surface, which is made from tempered safety glass which can be adjusted up to 35 degrees. This is an especially solid craft station, with long-term customers positively commenting on its durability. However, some had problems during assembly, mixing up the front and back table and finding side sleeve pockets a little too small for holding pens. You should definitely take care when assembling this station, following the instructions, to prevent any unneeded frustration. 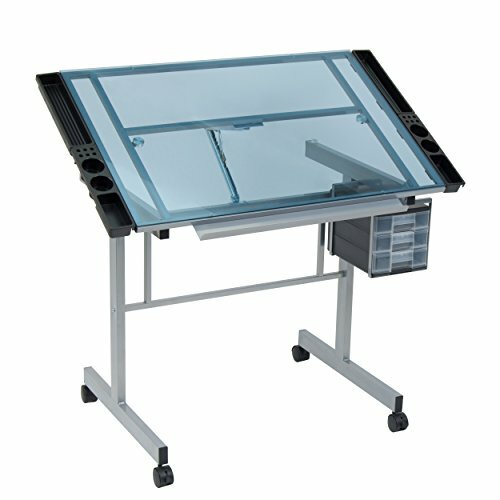 The Vision Craft Station’s top surface is made from tempered safety glass which is adjustable up to 70 degrees, offering this craft station huge customization options and great comfort while sketching and drawing. This craft station is made from heavy gage powder-coated steel and it’s constructed for high durability and long-term use. Many reviewers liked its light weight, which makes it relatively easy to move around and some said it’s really easy to set up for use. One of the customers complained about desk’s stability, saying it’s incredibly wobbly when erasing and moving around making all of the supplies in the side drawers fall out. This desk is very pretty, but not really good for heavy use. 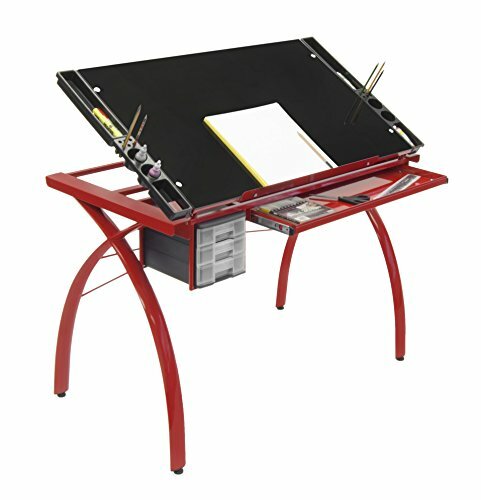 This red craft station has a very elegant design and comes with a 38“ wide and 24“ deep top surface made from tempered safety glass. 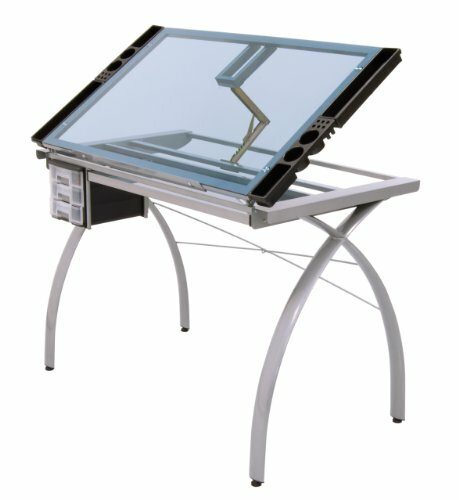 Top glass angle can be adjusted from flat to 35 degrees and it’s equipped with 4 removable side trays for supplies. One of the customers really liked the red, but had trouble during assembly, saying the instructions need a little clarification and the parts need to be labeled so you know which side is up and which goes to the front of the desk. Overall this is a good desk at a nice price designed for long term use. This Monterey craft station comes in 2 color variants: Black/Clear Glass and White/Clear Glass. The industrial-inspired design and modern look will add elegance to any home it comes to. 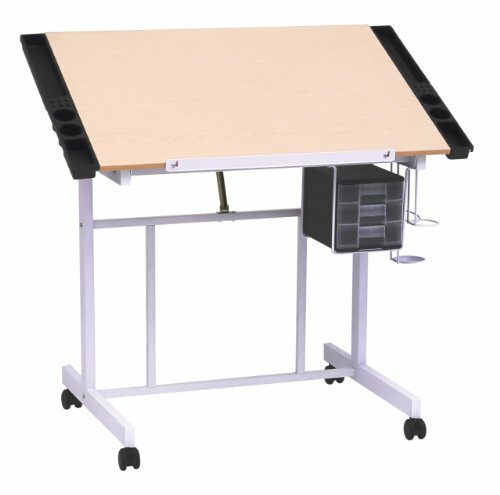 This craft station is perfect for crafting, sketching and drawing on its 35.5“ wide and 23.75“ deep main surface. We liked it’s stability and many customers concurred, saying that its sturdiness made it a real pleasure to work on. This craft station is a great value buy and the assembly takes only 30 minutes. It’s unlikely you will find a better desk at anywhere near this price. Craft stations that tilt provide an extra convenience, allowing for additional perspective on one’s work – but for that reason it’s important not to pile too many supplies on top of the desk, otherwise everything might slide off! 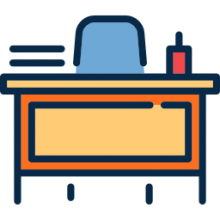 As well, there is an ergonomic advantage to having a tilting crafting station – it allows you to vary your working posture, so that you’re not perpetually slumped over your work. This is a great relief for people who often experience nagging pains from constant sitting. On its face, a craft station can seem like a pretty straightforward purchase. However there are some additional benefits to the practice of crafting that you might not be aware of. Research has shown that working with your hands provides emotional and cognitive benefits. This probably derives from the feeling of competence once you have completed a particular project, which helps to raise your sense of confidence as well. Creating art, or drawing, can be tremendously therapeutic. Art therapists have long advocated for the use of arts and crafts within the practice of psychology. From a neurochemical perspective, there has been research that shows that crafting helps to empower your brain, building up cognitive resources that help you to withstand the influence of harmful chemicals in the brain and the accumulation of proteins that are also harmful. Psychologists and psychiatrists that specialize in the study of creativity have also hypothesized that manual and purposeful use of your hands can help to decrease the risk of depression as well as increasing your sense of well-being. Crafting can generally be defined as the creation of items using one’s hands. It has a rich historical legacy that has been passed down from one generation to the next. Probably one of the best things about crafting this is its democratic nature- anyone can craft. And the barriers to entry are incredibly low! Historically, crafting was an item of necessity. In previous civilizations people needed to be able to create all manner of different household items. Nowadays it is incredibly easy to just purchase what you need online, and since it’s typically made of a type of plastic it will probably never break. So, crafting did fall out of popular usage, but has regained some momentum in the past 20 years or so as many popular websites have sprung up demonstrating the artistic and intellectual value of it. Craft stations like the ones that we have reviewed above are ideal work environments to practice the art of crafting. What with their ample surface areas and storage capacities, as well as their portability, they are invaluable tools for the intrepid crafter.